If this comic looks familiar, you're not crazy - it's remarkably similar to one we did a while ago. In the same way that I can't deal with coffee, Yuko can't deal with any of the super sweet drinks that I tend to favor ... most recently the Starbucks green tea frappucino. One new development since that last strip is that I started drinking tea - a lot of it! I got pretty sick the past couple of months, and so tea has become a staple, especially during the colder months. 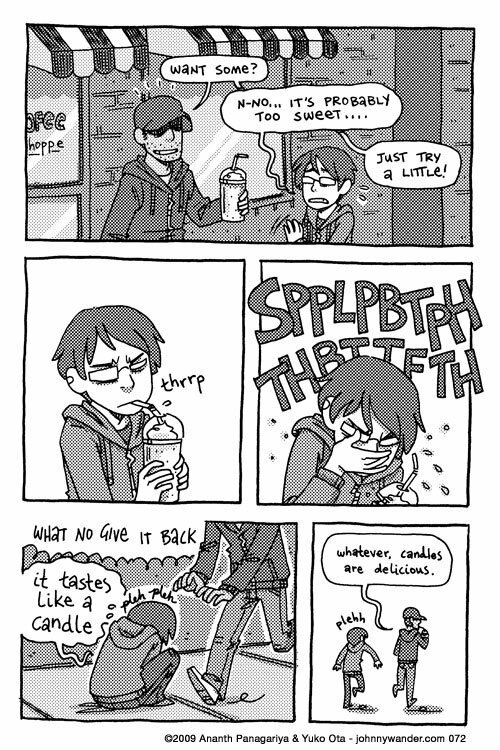 Actually, let me let you guys in on a secret: I usually get an extra shot of syrup in my drinks ... the normal drinks aren't sweet enough for me. It's actually gotten to the point that I consider it to be something of a personal failing ... I'm young so my metabolism is high, but my sweet tooth will undo me in the end. Any of you guys have a sweet tooth? How do you get it under control? That's the last of the comics I have! Next week is a guest week, I think you'll be happy to see some familiar faces. ;) See you then!